Welcome back, my hacker novitiates! In the previous two posts in this series, we looked at the basics of buffer overflows. In this post, we will look at one technique for finding buffer overflows. We will try to send random, oversized, and invalid data at a variable to see whether we can make it crash or overflow. This process is known as fuzzing. It is often the first step to developing an exploit, as we need to find some variable that is susceptible to overflowing. There are a number of commercial fuzzing tools, most notably Peach, which I hope to do a tutorial on soon. It is an excellent fuzzing tool, but it is not free. On the other hand, Kali has a number of fuzzing tools built in, including Bed, Sfuzz, and Powerfuzzer, among others. Among these free fuzzers, Spike is maybe the best. Spike is poorly documented and less than intuitive, but is powerful and adaptable once you become familiar with it. In fact, adaptability is probably Spike's strongest feature, while its ease of use is probably its weakest. In this tutorial, I hope to show you the basics of using Spike to lift the veil on its seemingly bewildering inner workings so that you can take what you learn here and run with this powerful tool to find your very own buffer overflow. Essentially, Spike is an API that enables us to quickly develop stress tests of the protocol or application of our choice. Since many of the protocols use similar data primitives, Spike gives us the capability too create these primitives and then vary them in ways they may be able to break the protocol or application. 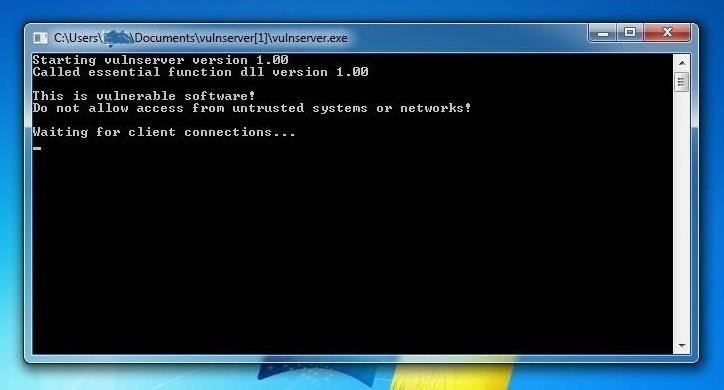 To learn and practice our fuzzing with Spike, let's download and install a purposely Vulnerable server for a Windows system. This server, known as vulnserver, can be downloaded from here. Download it and install it on a Windows system. This will create a vulnerable server listening on port 2015. In this lab, I will be using the default port 9999, but you can use whatever port you prefer. Now, let's try to connect to the Vulnserver with Netcat from our Kali attack system. As you can see below, Vulnserver displays its welcome banner and informs us that we can type HELP to get more information on the Vulnserver. Let's type HELP. Vulnserver responds with its valid commands. This will locate any file with .spk in it. When we do so in Kali, we get the output seen below. When we navigate to that directory and do a long listing (ls -l), we can see all of the sub-directories with scripts for auditing various protocols. Each directory then includes numerous scripts that can used to test and audit the given protocol. In this tutorial, we will be fuzzing a server, so we will probably want to use either TCP or UDP. Spike has a built-in script interpreter for each, namely generic_send_tcp and generic_send_udp, respectively. These interpreters are capable of sending data (in our case, fuzzed data) to the respective protocols when we supply an IP address and port number. In Kali, these commands can be found at /usr/bin, meaning that we can run them from any directory. In addition, we can access them through the GUI at Applications -> Kali Linux -> Vulnerability Analysis -> Fuzzing Tools. Let's try typing generic_send_tcp and see whether we can pull a help screen to give us some idea of how to use this command. All of the parameters here, I think, are self-explanatory with the exception of the last two, SKIPVAR and SKIPSTR. These two variables enable us to move to the middle of a fuzzing session defined by a Spike script. In other words, we can start a script, stop it, and then return to it at a later time. In our case, we will keep things simple and set these variables to 0. Let's try using one of the built-in scripts against our Vulnserver to start. Let's try fuzzing the SMTP protocol of our Vulnserver. As you can see in the screenshot above, this command starts Spike sending random, oversized, and invalid input to the SMTP server to test whether it can "handle" these inputs. If we go back to our Vulnserver on our Windows system, we can see that the Vulnserver handled this onslaught of irregular data without skipping a beat! The beauty of Spike is that we can create our own script to fuzz a particular protocol or application. Remember, when we connected to the Vulnserver with Netcat above, Vulnserver responded with its banner, and when we typed HELP, it responded with its commands. Let's try creating a script that will test the TRUN command in Vulnserver. Randomize the user input with the TRUN command. Your simple script should look like that below. It reads the banner (line 1), send the TRUN command (line 2), and sends randomized input with the TRUN command (line 3). When we hit Enter, Spike will begin to send the randomized and invalid data with the TRUN command to our server, as seen below. Eventually, we will see the following message: "Couldn't tcp connect to target tried to send to a closed socket!" Something has obviously gone wrong with our Vulnserver! 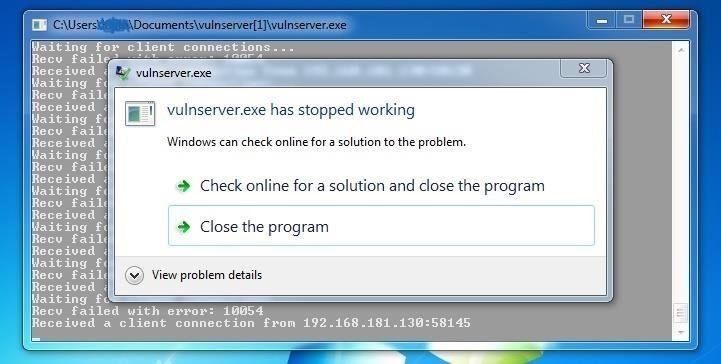 Now, let's go back to our Windows machine and check on our Vulnserver. As you can see below, the Vulnserver has stopped! Our fuzzing with randomized and invalid inputs to the TRUN command has caused the server to crash. 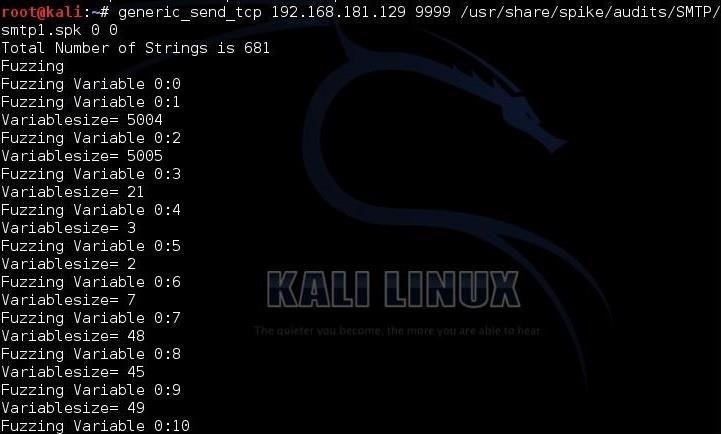 That's why we received the message in Spike on our Kali system that we could no longer connect. We now know that the TRUN command on this server is vulnerable! Fuzzing is the process of sending unexpected data at an application or protocol usually in the form of randomized, oversized, and invalid input to see whether we can create a buffer overflow or otherwise cause a fault in the system. This is a key step in finding a vulnerable buffer that we can then later develop an exploit for. Spike is an excellent, if under-documented, fuzzing framework for creating your own unique fuzzers. Its flexibility and adaptability are its strength and to find unknown buffer overflows, you are likely going to need to generate your own unique fuzzer. News: Test Your Hacking / Exploiting Skills with SmashTheStack! News: Null Byte Is Calling for Contributors! I get the tutorial... but I dont get its use... how is it a vulnerability? ? And if it is a vulnerability. .. how do we exploit it?? And yea im really looking forward to more posts in this section... please complete this series!!! THANK U!! Great tutorial :) Thanks for giving us a way to safely practice this tutorial. I understand this in the context of the tutorial. However, I am under the impression that most servers will not have a 'HELP' command in netcat that tells you all of the available commands to test. Correct me if I am wrong. Hello. I came to ask if any more tutorials will be posted for Exploit Development. I believe that Peach Fuzzer is now free, and also, would like to ask: is there a way to find an exploit with a fuzzer like this, for, say, a prison, or other Non-Usable OS? Like in Mr.Robot, Elliot mentioned finding an exploit in Vera's prison in the latest episode. The reason that would differ from your tutorial on spike, Is the problem that you may not install the Prison's OS, for example, to test on. Yes, more are coming. Peach is not free, but they do have a trial version that is free. As for the rest of your question, I don't understand what you are asking. The prison is not using a separate OS. It is likely using an application running on a standard OS. Really, In a simple context, what I mean is Can you fuzz an OS that is not released to the public/is not for download? EDIT: Okay, Guess i'll have to pay for peach. I think you are confusing OS with an application. Most often, you can scan an application for known vulnerabilities. You fuzz to find your own unknown vulnerabilities. That is a much longer term project. Usually, weeks, if not months. No, What I mean is This: Let's say,as an example, the Chinese government has designed a completely new Operating System, and You are Hired by the US Gov to hack it. How do you find an exploit, In the OS, Like that one in System32 (I forgot what it was called) When not up for Release? I understand Fuzzing an application would work, but what if all were Hand-Written, and unreleased? Crack Code: I have an idea! the only way to solve that is when you go through the Hand-Written or Documentation of the OS and possible create a clone of the OS and use it as a testing, but you not sure if the OS are rely same, but you might be lucky to get it! this method works only when it's an organization authority, which means they will provide you an OS programmer to build a clone for you. Great tutorial. When is the next one in the series ? Could you please continue this series I think it's really great for a newbie like me. Great tutorial OTW I hope to see more of this particular series or anything like it. Stick around. I'll get back to it soon.